This collection of essays by five notable Masonic scholars (Joseph Fort Newton, Albert Mackey, Bro. H. L. Haywood, Bro. H. A. Kingsbury, J. George Gibson), discuses the single most important symbol that Freemasonry has. 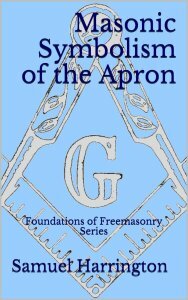 It covers the antiquity as well as the esoteric symbolism of our most valued vestiture and what is often overlooked by those outside of the fraternity: a simple, square, white, lambskin apron.